Made with Real Cream and Real Chocolate, this 1.16oz individually wrapped Chocolatey Fudge delight features only the highest quality ingredients for a smooth and creamy flavor. 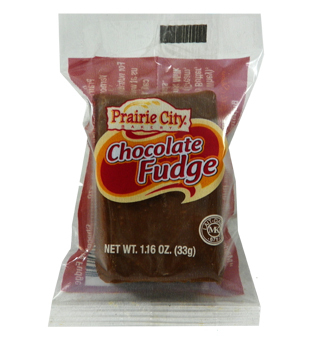 Prairie City Bakery’s individually wrapped, bite-sized pieces of indulgent Creamy Butter and Chocolate Fudge are the perfect size for a convenient, decadent treat! For the ultimate in impulse sales, simply place Prairie City Bakery Fudge in its own attractive merchandiser on the front counter for fantastic fudge selling. Available in two Fudgy flavors: Chocolate and Creamy Butter.